The rain hitting my window in the early morning was so loud that it woke me before the alarm went off. It continued to pour all through my first class, but by the time I found my way to my favourite panoramic window at school the clouds were starting to break. Parts of the city were silhouetted against a rather dramatic sky and clouds just starting to open up. Last week when I painted this same view on a sheet of good paper I was able to wet the sky and go in with pigment but trying to cover a big surface in a sketchbook is more of a challenge. The sky just doesn’t stay wet long enough to go back into the initial wash with more colour. The resulting sky is a bit more hard-edged than I had hoped, but I was still happy to find a few minutes in a busy teaching semester to push around some paint. Happy Thanksgiving Jacques. I hope you have a wonderful holiday. That sky! I will keep this in mind when I next go out. Lovely. I have seen some turbulent skies in Florida in the summer but how are they at this time of year Lee? Happy Thanksgiving! 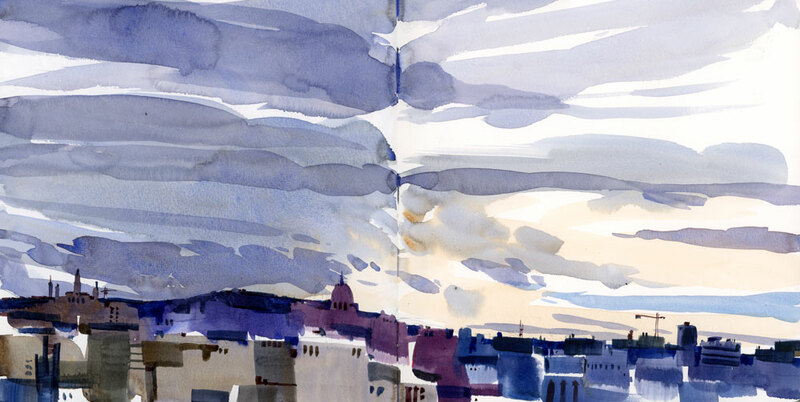 I love how the clouds hit the middle of the sketchbook, and bleed into the binding.